PHILADELPHIA — As Mike Brey, stubble-faced and open-collared, sat in a folding chair addressing a media scrum outside his Notre Dame team’s locker room Friday night, attention quickly turned to his lower half. The right leg of his pinstriped black suit pants was bunched at his knee, under which a bag of ice was taped liberally around his exposed calf. He’d strained the muscle, he said, leaping in response to a play during the second half of his team’s 61–56 win over Wisconsin in the Sweet 16. He spent the remainder of the game limping, at first fearing he’d injured his Achilles’ tendon. Friday was a night when little looked pretty for the Fighting Irish, from their coach’s gait on down, but they too can look forward to Sunday nonetheless. Notre Dame’s win over the Badgers began as a slog, its star guard cold and clanking, then transformed into a thriller in which the star reclaimed his expected role as hero. It saw a team known for its offense put up unsightly stat lines, with its supporting cast offering crucial lifelines to remain afloat. And yet it ended just as the Irish’s two prior NCAA tournament games had, with Notre Dame emerging on the right side of bitten nails and surviving to move on, limp be damned. And did it ever begin ugly. The Irish had come into the game wary of Wisconsin’s half-court defense, hoping to push tempo enough to minimize its impact. Instead, Notre Dame were bogged down in one drawn-out half-court set after another, coming up empty. Jackson and forward Zach Auguste combined to miss 10 of their 12 first-half shots; guard Steve Vasturia missed all four of his. At one point the team combined to make one field goal in the span of 14 attempts. Among the few bright spots was Farrell, a once sparingly used guard (and two-star recruit from central New Jersey, not far from Philadelphia) inserted into the starting lineup for the tournament. He entered Friday having used just 14.4% of the Irish’s possessions while on the floor and taken just 12.1% of their shots. He entered halftime with a team-high seven of Notre Dame’s 19 points, on 3-of-4 shooting. For the rest of the Irish that gear was elusive; aside from Farrell, the team shot 4 for 25 (16%) in the first half. The Badgers were hardly a juggernaut themselves (34.6%), taking a 23–19 lead into the break that had observers cracking jokes about a contagion having been left on the court by its usual occupants, the NBA’s woeful 76ers. By the first half’s standards, the second was a shootout, with the teams combining for 15 points in its opening four minutes. The Irish soon found another hot hand in junior V.J. Beachem, who spent last March falling out of Brey’s rotation and has spent this one as his leading scorer. The Badgers were buoyed by their own March-to-March turnaround story, Ethan Happ, who redshirted last season and on Friday nearly had a double double through his first 18 minutes of a physical battle inside with Auguste. But his night would end early: With the Badgers leading by two (after a putback by Happ) and a ball loose on the floor with 46 seconds left, Happ was whistled for his fifth foul. He wandered over to the Wisconsin bench, hands folded atop his head, until sitting and burying his face into a towel, a picture of frustration. He would spend the finish as a spectator, watching Auguste make two free throws to tie the game. Wisconsin too had been through a lot in a season that now ended later than almost anyone had expected. The Badgers’ rollercoaster has been well-documented: longtime coach Bo Ryan’s midseason retirement; the slow start under a promoted Greg Gard, whose father died on the eve of the season; a 9–9 record turning into an 11–2 regular season finish; a buzzer beater from Koenig last Sunday to reach the second weekend. 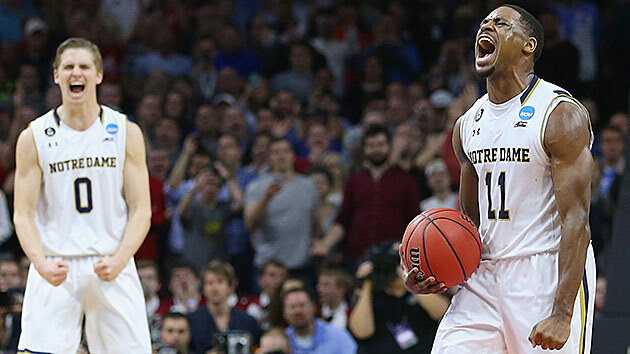 Notre Dame now reaches its second Elite Eight in as many years, after losing a thriller to then-undefeated Kentucky a year ago. It is a chance for the school’s first Final Four in 38 years, since Digger Phelps roamed the sideline. Standing its way is a North Carolina team that throttled the Irish by 31 in the ACC tournament, in what Brey called a burn-the-tape loss. Reclining outside the Irish locker room, he did not yet know his team’s draw, but he did not seem concerned about how his team would respond to falling behind yet again.